Tai Zi Heen at Prince Hotel & Residence Kuala Lumpur is no new kid on the block. 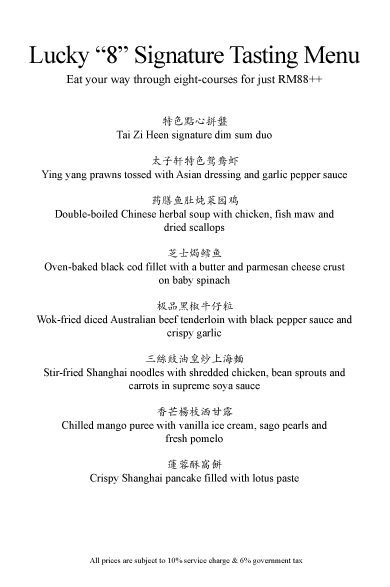 In fact, Tai Zi Heen is infamous for serving refine Cantonese cuisine by their award winning Chef Ricky Thein. I have had the opportunity to dine here several times and each time, the quality and flavors of the dishes were excellent and perfectly flavored. The restaurant also has a reputation that serves one of the most innovative and modern dim sums! When I received an invitation to sample their August menu with a special Lucky “8” Signature Tasting Menu@ RM88++, I jumped on the bandwagon as I know Chef Ricky’s talented skill in creating innovative and scrumptious dishes with a twist! Despite the usual city hour jam, I braved my way through and arrived feeling ravenous and yet excited. The ambience at Tai Zi Heen combines a contemporary artist design with a rich and exclusive décor, creating an elegant and sophisticated ambience. I love the private room which has a gorgeous view of the hotel’s contemporary chandelier in the main lobby. I was always attracted to chandeliers and this one certainly has me hooked on it with its unusual and artistic curves! The master chef himself, Chef Ricky T. whose talent and skills are deftly present in every dish at Tai Zi Heen! We started our meal with the most important dish in every Cantonese cuisine, soup. A lovely Double Boiled Baby Winter Melon Soup (RM22 per portion) with bits of chicken and scallops were so soothing that it warms the heart and takes away all the stress for the day. The broth was silky smooth and full of body yet retaining the lightness of a beautiful stock. Bits of chicken and dried scallops provided texture while the soft winter melon flesh was an ease to devour. Every ingredient in the soup combines beautifully like a harmonious melody… simply amazing! We also sampled a second soup of Double Boiled Chinese Herbal Soup (RM22 per portion) with chicken, fish maw, scallops, mushroom and baby ‘bok choy’. This one had a clear lighter broth chock full of goodness from the hours of simmering. The fish maw and scallops enhances the seafood flavors while the vegetables provided a good crunch to the soup. The flavors were clean and well balanced, creating warmness to our tummies. Ying Yang Prawns Tossed with Asian Dressing and Garlic Pepper Sauce (RM26 per portion) was attractively presented in the Ying and Yang design. Crunchy huge prawn balls were covered in two contrasting sauces and looked simply too beautiful to be eaten. 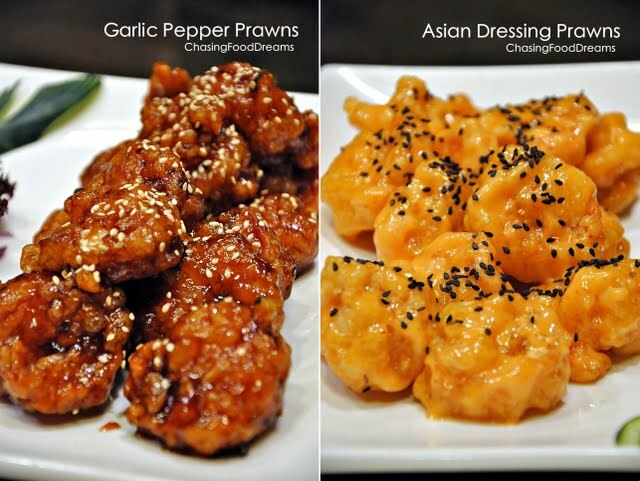 The first one with Garlic Pepper Sauce had a slightly sweet and robust flavor while the second sauce of Asian Dressing was creamy and luscious. The prawn balls were first deep fried and then coated with the sauce. Chef Ricky’s skill definitely lends the winning edge to this as the prawns remain crispy and warm even though it was enveloped with the sauce! Butter Oat Soft Shell Crab (RM32 per portion) came piled high and nestled in a pristine white noodle bowl. Crispy battered soft shell crab pieces were tempered with buttered oats, curry leaves, chillies and bits of garlic. Decent as the soft shell were fried to a light batter but nothing to shout about. Cod fish stole the show that night! Featuring another contrasting dish, we enjoyed the truly fabulous Oven-baked Black Cod Fillet with Chinese Teriyaki Sauce (RM58 per portion) and Oven-baked Black Cod Fillet with Butter and Parmesan Cheese Crust (RM58 per portion). The Chinese Teriyaki glazed was sweet and savory, thus giving the bland cod a great kick up flavor. The cod with Butter and Parmesan Cheese Crust was truly unique as the smell was heavily perfumed by the baked cheese. Cod was flaky but had the lovely crisp coating while the butter and cheese enhances the creaminess of the oily fish. A masterpiece in my opinion!! Wok-Fried Fresh Scallops with Hong Kong Vegetables (RM58 small portion) was light and refreshing. I love the crunch of the snow peas, celery, lotus root and black fungus against the soft sweet flesh of the superb scallops. A good dish as it showcases the ingredients’ natural flavors in a light seasoning. Blue River Prawns with Crispy Egg Noodles (RM48 per portion) was another showstopper in our meal. A huge half of blue river prawn braised in a luscious egg sauce sat in its full glory on top of the crispy egg noodles. I could spy the scattering of prawn roes on the river prawn! The gravy was silky and coated the noodles lovingly. The prawn was cooked till just right with a hint of seafood sweetness while the prawn roe enhances the salty flavors of the crustacean. We also enjoyed a healthy dessert in the form of Chinese Herbal Jelly with Honey (RM10 per portion). Simple and healthy, this dessert fared decent with everyone. 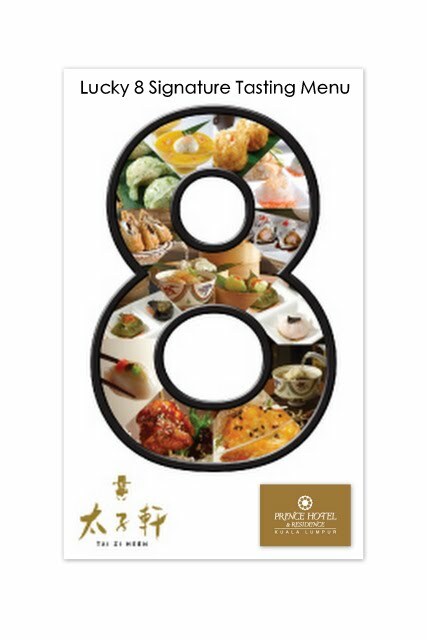 With that said above, one should definitely take their August promotion of their Lucky “8” Signature Tasting Menu to try out some of the above dishes at the promotional price! Tai Zi Heen managed to impress me again this round. Dishes were all so well calculated and meticulously prepared with such control of flavors and textures. Chef Ricky is constantly challenging the creativity of Cantonese cuisine and one can expect nothing but the best in taste and flavors at Tai Zi Heen! 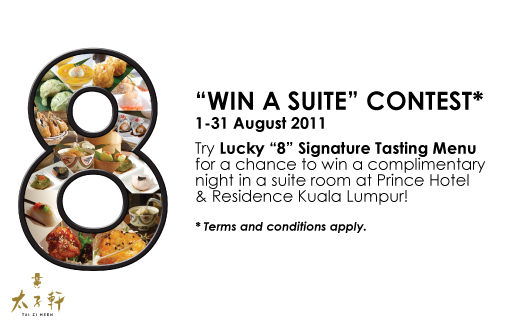 Psst… one can even win a complimentary stay at the hotel with the promotion… who knows! Jalan Conlay, 59459 Kuala Lumpur, Malaysia. *Thanks to Prince Hotel & Residences KL and BBO for the lovely invite!